What fun and yummy little fruits kumquats are. For those of you unfamiliar with these petite citrusy bites, they’re all kinds of entertaining. For instance, you can pick them up and pretend to be a really big scary giant, just hanging out with an orange. See? Fun! Or if prancing around the kitchen shouting fee-fi-foo-fum at the cat isn’t really your idea of a good time, you could always offer them to unsuspecting boyfriends, telling him of course they can be eaten skins and all; and try to supress your giggles while his face puckers up and turns inside out. Ha! 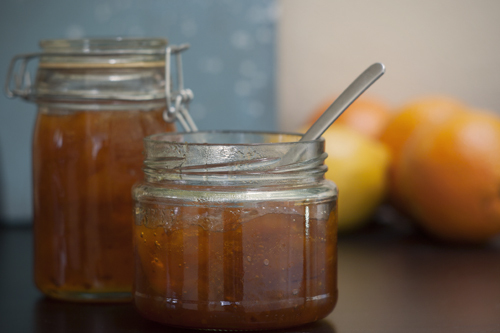 But if winding up your loved ones ain’t your thang, I guess you could just make marmalade. It’s not quite as fun, but it’s sure as hell deeeeelicious. 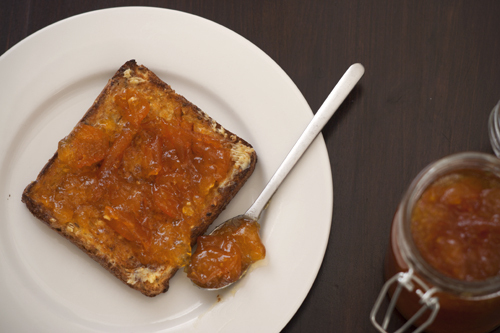 I love marmalade and will always have a jar of it in the fridge for weekend toast-fests. 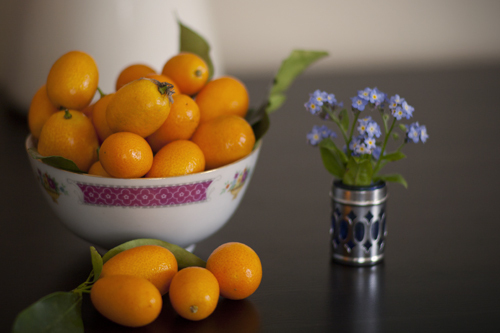 I’ve made it plenty of times before, but never with kumquats, so I hit the interwebs for a little inspiration. I found quite a few recipes recommending adding vanilla extract, which seemed straight forward enough; but I also found several recommending using rice wine (or a mixture of rice wine and water) as the cooking liquid. Alcohol in a recipe is always guaranteed to grab my attention, I was intrigued. For my own marmalade, I decided to use vodka. I figured the citrus flavour could handle a bit of a kick, and hell, even if it didn’t work, it would certainly make the weekend toast-fests a little more entertaining. I got lucky, it worked; and boy does it taste good.